It took me a long time to understand where he came from. 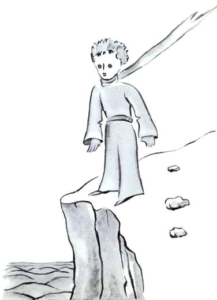 The little prince asked me many questions. I also asked him questions, but he usually didn’t answer them. But from his speaking, I slowly started to understand many things. I will not draw my plane here. It is too complicated for me. And the little prince started to laugh very loudly. I was angry. My situation was serious. How could somebody think that it was funny? But he didn’t answer me. He only moved his head gently. He was still looking at my plane. And he started to think deeply. He was thinking for a long time. Then he took his sheep out of his pocket. And he started to look at the sheep carefully. So, this way, I learnt a second very important thing. 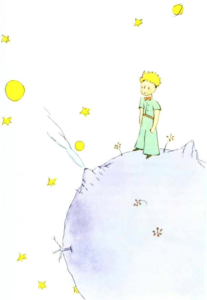 The planet of the little prince was very small. It was only a little bigger than a house. But it’s true that it wasn’t a big surprise. I knew very well that we don’t only have planets like Earth, Jupiter, Mars, and Venus, which have names. There are also hundreds of other planets which are sometimes so small that it’s difficult to see them through the telescope. When an astronomer discovers one of them, he doesn’t give the planet a name, but only a number. He calls it, for example, Asteroid 3251.